As I go through my library of books on Laos, I feel compelled to share some books I still find interesting today and that may be of interest to others even though the books came out years ago. I try not to bore readers with an overly long or technical review so here's my brief review. 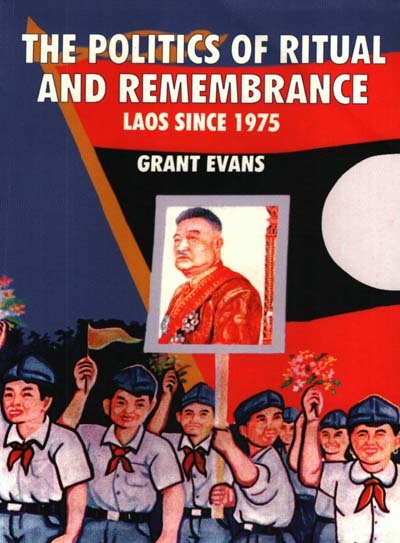 Admittedly, this is an older Lao history book published in 1998. It has a focus on, as the title states, ritual and remembrance in Laos and how the state uses those tools as a method of legitimization and to perpetuate cultural traditions. I re-read this book recently to help refresh my memory and in order to prepare for writing this. I hadn't read it in over 10 years! Surprisingly, it's still enjoyable and educational. Primarily for me it was the little random tidbits of info throughout the entire book that I found quite educational. Below are some random selections off the top of my head I'm mentioning but there's of course a whole lot more covered in this book. The discussion on Champassak New Year's celebration or how it used to be when the principality still existed with King Boun Om Na Champassak was still there and why it's changed. The Lao flags and how they were created. When the Lao national anthem was written and by who. The discussion on the worship of Chao Petsarath as someone who was believed to be sukseet (divine) with possible powers and abilities. Author quotes from online discussion boards of Lao people discussing what it means to be Lao and whether Lao, Laotian, Lao Hmong or just Hmong, are suitable descriptions and why or why not. Young Lao people abroad vs those living in Laos and how those living abroad attempt to recognize their ethnic identity. If any of the items I just mentioned interest you, then you should definitely read the entire book. Yes, some of the info is dated but it's no less interesting to read. However I don't doubt some people may find some chapters a bit dry. However overall, I consider this a good read and quite insightful. Full table of contents shown below. Grant is an Australian and former professor who has written several books on Laos and who currently resides in Vientiane. That Luang: "Symbol of the Lao Nation"